This ale has a warm golden colour with a fruity aroma and a crisp, bitter finish. It is traditionally brewed using a blend of the finest British hops and malt, harvested from organic farms and the Prince of Wales' Home Farm at Highgrove. 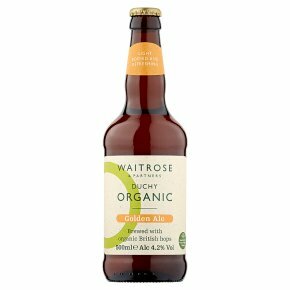 Organic British wheat delivers a light, refreshing, moreish finish. Good Causes - Sales of Waitrose Duchy Organic products provide a donation to The Prince of Wales's Charitable Foundation. This year, over £2.5m will be donated to the Foundation, supporting good causes across the UK. Since 2009, you've helped to raise over £17m for initiatives such as the Duchy Future Farming Programme, which helps farmers develop more sustainable farming practices. Brewed in Oxfordshire. A refreshing light bodied ale brewed with British Wheat, Fuggles & Goldings Hops. This Golden Ale has been brewed using specially selected organic British hops, malted British barley and a small amount of British wheat to deliver a refreshing finish.